Jasmine has been on crate rest for about two weeks now. She’s not happy about it. It’s very apparent that she’s feeling better and that she’s NOT happy about being crated. 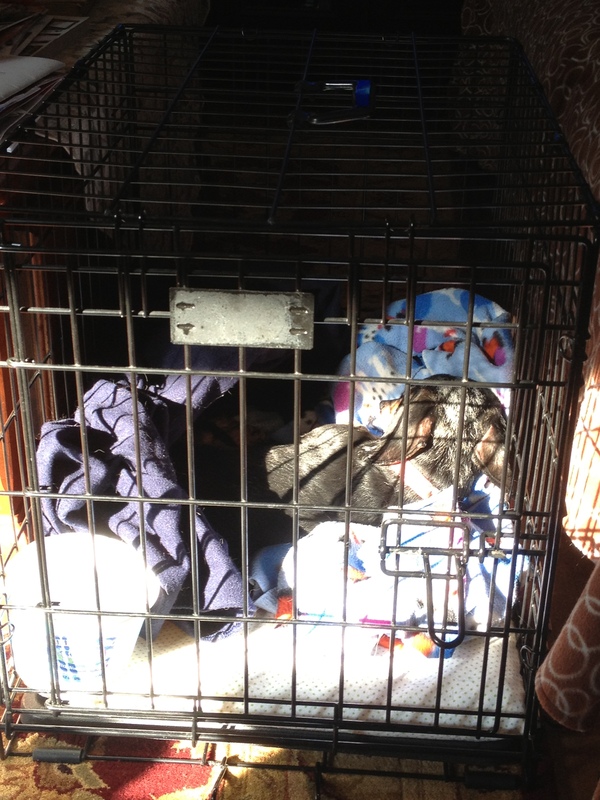 For those of you who haven’t had a pup that has been on crate rest…well, you’re lucky. Imagine being in prison; your cell is just about large enough to stand, lie down, turn around and sit in. Your meals are all served there. The only time you get to go out is when you have to use the bathroom. Your friends are walking around you and taunting you through the bars. Your family is sitting outside your cell, giving you treats and pets, but you can’t go out and hug them. You stare at them with sad, lonely eyes. For hours and hours on end. You finally relent, bury yourself in your blankies (yes, your prison has blankies), and in a huff…you nap. But at every move, every crackle of a plastic bag, you jump up, ready for action. That’s what the last two weeks have been like. Now, when Jasmine had IVDD the last time, this lasted EIGHT weeks. Of course, some of that time was spent at the kennel (it was right in the middle of our move from California to New Hampshire). It SEEMED easier. Perhaps because Jasmine was a different dog back then; she was much less playful, energetic or demonstrative. And she didn’t have Juliet traipsing around either! Jasmine’s sentence is officially over on Friday. Thank goodness! And it seems that there are no serious/lasting injuries. She doesn’t seem to be in any pain or discomfort. What’s also nice is that the vet and the vet tech both noted how very different Jasmine is today. When she first started seeing the vet in NH, she used to shake in fear so badly that they could barely keep her still enough to do blood draws and exams. Even though she’s still scared, she’s a much more calm and ‘normal’ dog today. It’s good to see that other people notice the positive changes in her. If you have ever had a dachshund, you know that one of the most dreaded (and common) health issue with the breed is IVDD–Intervertebral Disc Disorder. Basically, it’s a spinal cord injury due to a herniated or ruptured disc in the spine. Jasmine had this before we moved from California to New Hampshire and fully recovered with crate rest. Late last week, Jasmine came out of the sleep crate a different dog. Instead of her bouncy, happy self, she was timid and off. She barely wagged her tail. She didn’t play. She was like this all day, and I was worried. However, her appetite was good and she wasn’t yelping in pain. When she woke up the next morning with the same disposition, I immediately made an appointment with the vet and took her in. He gave her a thorough exam, checked her bloodwork, and then prescribed some pain medication to see if it would help her disposition. It did. Within a few hours, she was perkier. The next morning, she was back to her old self. Given these signs (including a slight tenderness in her back during the exam), he’s thinking that she injured her back again (or it’s flaring up). She’s on strict crate rest for at least two weeks; the Dodger’s List group recommends eight full weeks of crate rest. Oh, she’s not going to be happy. But I need to make sure that my pup is okay. If you haven’t done crate rest with a dog before…well, it’s not fun. It means that the only time she should be out of the crate is to go potty. No running, no jumping, no playing. She eats in the crate. It’s intended to restrict her movements so she can get the rest her back needs. Given that she’s feeling better now, keeping her contained is not going to be easy OR pleasant. But it’s what we need to do to help her heal. Since we returned from our travel odyssey, Jasmine has been a much more demanding, stubborn dog. Okay, so this is my fault. I have spoiled this dog rotten. She get what she wants. But she’s been getting vocal about it. Demanding. Little moans and maw-maw-maws in complaint if I’m not giving out her favorite treats. And then there’s the “I don’t want to do what you want me to do so I’m going to ignore you” stance. When it’s time to go outside, go to bed, etc., and she’s happily ensconced in her doggie bed (now THAT’s another story), she gets a scorching bout of SCH. Selective Dachshund Hearing. As in…oh, my hearing is going bad, because I’m going to just lay here and do what I want to do. And you know, she might be getting to be a little diva, but I kind of like the fact that she’s becoming more assertive…more…Dachshund-like.